For 30 years, the Academic Excellence (ACE) Program at UC Santa Cruz has been helping students succeed in their classes and graduate with degrees in science, technology, engineering, and math (STEM) fields. Nancy Cox-Konopelski has been with the program for 27 of those 30 years, serving as director for the past 18 years. "I've seen a lot of students move on to become the leaders that we expect them to become," she said. "Our mission is to increase the diversity of those who choose math- and science-intensive majors, with the hope that the faces of tomorrow's STEM leaders will reflect the faces of our nation as a whole." Nationally, only 40 percent of students who start college expressing an interest in STEM majors actually graduate with STEM degrees. 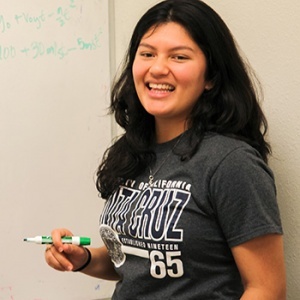 Students who participate in the ACE program at UC Santa Cruz persist and graduate in their STEM majors at a much better rate. They also earn more A and B grades and fewer non-passing grades in ACE-supported courses than their matched peers. 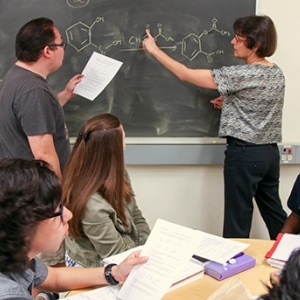 At the core of the ACE Program are collaborative problem-solving sessions that supplement the introductory science and math courses so many students struggle with in their freshman and sophomore years. 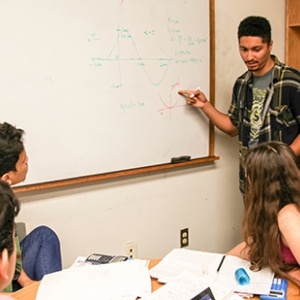 The sessions meet twice a week and provide a group study environment where students learn by working together, with guidance from ACE professional and student staff members. "ACE staff make sure to challenge students academically. They want you to excel, and if you're willing to put the work into the class, you will do well," said Sarah Deleon, a sophomore biochemistry and molecular biology major who has been in the ACE program since her freshman year and joined the student staff in September. In addition to helping students with their courses, the ACE Program develops students' study skills and communication skills, builds their self-confidence, and provides guidance on academic and career planning. According to Deleon and other students, the program's friendly and supportive environment is a key to its success. "It's a very supportive community, and you form long-lasting friendships," Deleon said. Ian Weaver learned about ACE through his involvement in the National Society of Black Engineers, joined the program his freshman year, and has been on the student staff since he was a sophomore. He said the program provides a nurturing environment with a built-in peer group and mentors who are available to talk any time. The benefits go beyond the tangible resources and course support, Weaver said. "It's a place where you can talk to other people about your passions and your goals in life. You can say those things out loud, and it makes them more real and gives you confidence," he said. A senior physics major with a concentration in astrophysics, Weaver is now fielding offers from astrophysics graduate programs--so far he has been accepted at Harvard, Princeton, Yale, UC Berkeley, and the University of Arizona. The ACE Program aims to serve students from groups that have not traditionally pursued degrees in STEM fields. Enrollment priority is given to students eligible for Educational Opportunity Programs (EOP), including first-generation students (first in their family to attend college) and students from low-performing high schools or low-income backgrounds. ACE students not only earn better grades than their matched peers, they also show higher rates of persistence to degree than non-ACE students. Among students who started their freshman year at UCSC intending to major in biological sciences between 2002 and 2008, first-generation ACE students declared a biology major and graduated with a biology degree at higher rates than students not in the ACE program, whether first-generation or not. Paul Koch, dean of physical and biological sciences, said the ACE Program reaches only a fraction of the STEM students who could potentially benefit. "We need more resources so that we can reach more students," he said. The program served nearly 700 students last year, with up to 30 paid student staff members and four professional staff members (all former ACE students and student staffers). "The campus has made it a priority to fund us all these years. Even in the leanest budget years we were never cut," Cox-Konopelski said. "I'm very proud of this campus for that. But the fact that we're an established program makes the federal funding agencies less interested, so we need to raise private funding to continue to serve more students." Support for the program comes from a variety of sources, including NSF grants to faculty; Julie Packard, through the Dean's Fund for Diversity in the Sciences; Joe Konopelski and Nancy Cox-Konopelski; the Mervyn L. Brenner Foundation; and gifts from UCSC alumni and past and present ACE students and their families. On Saturday afternoon, April 30, during Alumni Weekend 2016, the ACE Program will hold a 30th Anniversary Celebration. ACE alumni and their family and friends are invited to meet at the Engineering Courtyard behind the Jack Baskin Engineering Building for an ACE Open House.